'A Tale of Two Sociopaths': Latest Edition of the Humor Times' FREE App! In the latest edition of the News in Cartoons Humor Times app, called A Tale of Two Sociopaths, the world’s greatest editorial cartoonists (who populate our popular Humor Times magazine with great material every single month) review the latest news in the way only political cartoonists can. 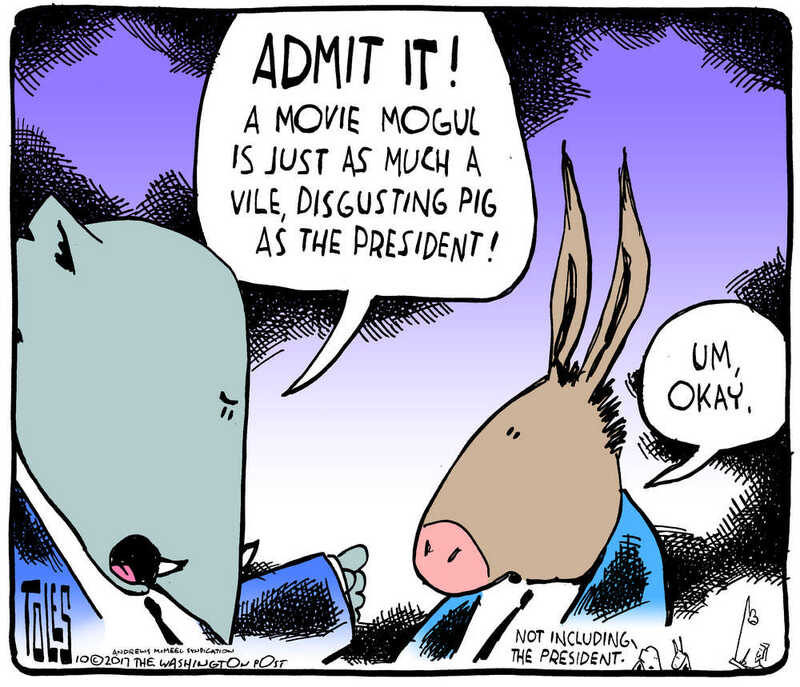 Cartoon by Tom Toles, from the latest edition of HT’s free “News in Cartoons” app. His work is also featured in the Humor Times monthly magazine, along with many other great editorial cartoonists. 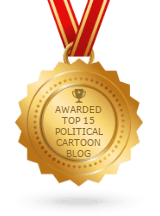 Each edition of the News in Cartoons Humor Times app features a string of hilariously biting editorial cartoons for the reader to swipe through, strung together with narrative captions — telling each week’s recent news story in a very entertaining way. See recent archives of the app on the website here. To see the most recent editions, however, you’ll need to get the app! The country was treated to the awful spectacle of two sociopaths, one a conservative on the East coast and one a liberal on the West coast, both oblivious to their own dreadful repulsiveness. The so-called president* once again demonstrated that he does not have an empathetic bone in his body, as he cluelessly hurt an already grieving widow with his insensitive remarks. Meanwhile, we were reminded once again that Hollywood is still a cesspool of patriarchal sexism, as Harvey Weinstein, movie mogul, was exposed as a serial sexual assaulter. These are very serious issues, and our incredibly talented editorial cartoonists do not take them lightly. However, their insightful and probing work does highlight the hypocrisy of lawmakers and celebrities alike, who think they can do anything and are above reproach. Yes, it is times like these that call for the talents of the world’s greatest political cartoonists, who help to give us perspective while taking the unprincipled down a few notches. The News in Cartoons app also features a “bonus cartoon” each issue, as well as a funny video of the week — this week’s short being a great one from Samantha Bee’s Full Frontal show, as she eloquently takes down Weinstein and all chauvinist male bosses. The Humor Times “News in Cartoons” app is available only for Android phones or tablets at this time, but we hope to be rolling out an iOS versions and others soon. It’s the FUN way to get your news! Each edition is basically an excerpt from the Humor Times monthly magazine (available in print or digital format all over the world), a publication that reviews recent news stories in hilarious fashion with editorial cartoons by the finest in the business, arranged with a running narrative above each cartoon, stringing them together to tell a recent news story. Are You Ready for Corporate America’s Robot Economy?